If you later want to expand your system, you can extend control of your window blind radio motors to your web enabled devices (PC, phone, tablet, etc) with the RFXCOM™ plug-in for Vera™. With Vera or Veralite, you can easily monitor and control your home whether you are on the premises or away. The Vera system is also about CHOICES. You can control many other devices aside from our Rollertrol™ blind motors, using many different home automation protocols: Z-Wave, x10, Insteon, Zigbee, etc. The images above and in this article series are screen captures of what you will see in the browser viewport of your PC, tablet, phone or other web enabled device. The instructions that follow explain how to set up and configure the RFXCOM™ plug-in for Vera that will give you control over our RollerTrol™ shade and blind motors. These instructions assume that you have assigned at least one of our RollerTrol™ motors to the remote control. The instructions for assigning motors to the remotes will not be discussed here; the instructions in this article cover the installation of Veralite™ and the linking of our motors to Veralite™ via the RFXCOM™ USB transceiver. We are also assuming you have connected and activated your Vera or Veralite to your router or Internet feed (as in the previous Part 2 of this series). The message area: even on a fast connection, it can take a few seconds for files to upload or data to be saved. When this happens a message will appear here, indicating that a process is underway. If you have scrolled down the page, you may not be able to see this area, so be sure to scroll back up and make sure a process has completed before moving on to the next step. Sometimes the text on the screen below may indicate that an upload is complete before the message area indicates that it is finished; it is good practice to always wait for the message area to indicate that it is finished. The save/upload prompt: if you have made changes, the Vera system will often prompt you (red 'Save' button appears) to save your changes. When you save your changes, watch the message area to see that it has completed. 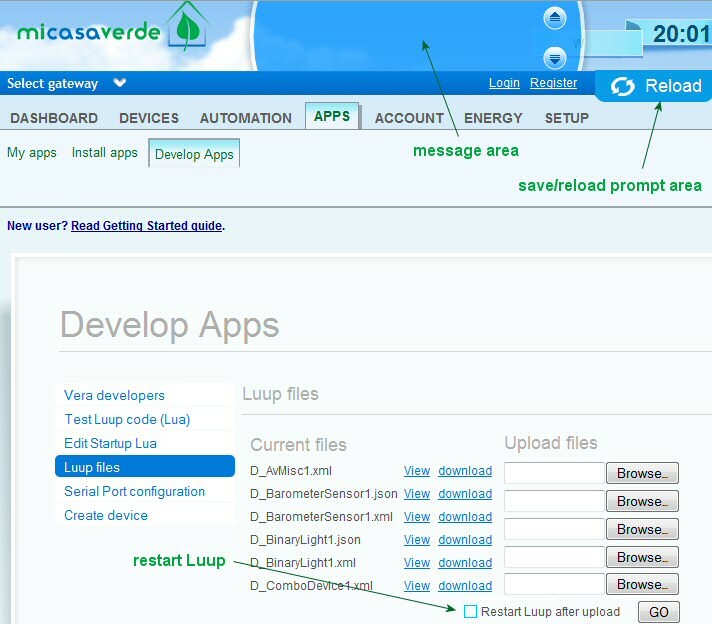 The restart button: when you see the 'Restart Luup' directive in these instructions, this is where you do it. It does not matter if you are not uploading files, you still use this area to restart Luup. Once you have downloaded the config files, make note of your download location on your local machine, ready for upload into Vera memory. Use the 'Browse' button on the Vera interface screen (shown in picture above) to upload the RFXCOM transceiver config files to your Vera or Veralite unit. BE SURE TO CHECK THE 'Restart Luup' CHECKBOX WHENEVER YOU DO THIS. 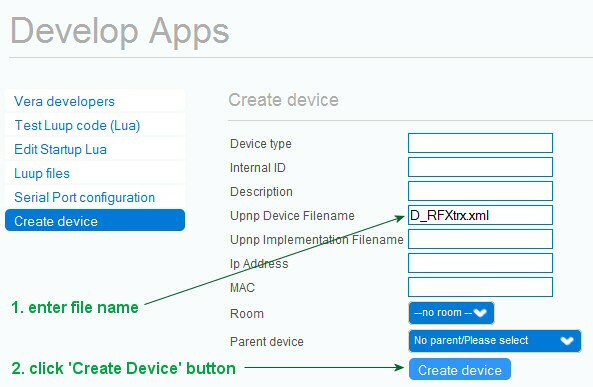 Enter this file name in the "Upnp Device Filename" field: D_RFXtrx.xml then click "Create Device" button. A device named "RFXtrx controller device" will be created, with a confirming message on the screen. You do not need to enter anything else in other fields. Set speed to 38400 baud and select the device named "RFXtrx controller device" in the field "Used by Device"
When you move your mouse over the title bar, you will see the 'wrench' icon appear, which is the pathway to the setup screen for the USB transceiver. Click on it to expose the settings dialog screen, as below ... then click the RollerTrol Enable button to activate the Rollertrol device control system. SETUP IS COMPLETE! Note that are many other devices that can be controlled by the USB transceiver, and it is possible to add more transceivers if you wish to further expand your system at a later time. Here's where the real magic begins. When an up/down/stop button on the RollerTrol™ hand held remote is pressed, the USB transceiver will receive the radio RF signals and cause the Vera system to automatically 'learn' the RF commands for that channel. An icon dialog screen will automatically appear in the user interface, just like the one you see here - put your mouse over it to see the settings icon appear in the title bar. You can also continue adding channels and motors (or motor groups) by pressing additional channel buttons on the remote control. It doesn't get any easier than this! From this point, you can assign your blind motor to a room and treat it like any other device in the vera system, creating as many events and scenes as you like. This is the end of the series "How to use Veralite & the RFXCOM™ USB transceiver with our blind & shade motors". We sincerely hope you enjoy using these advanced motor systems; if you have any questions, please feel free to contact us at any time!